Born on Halloween, actor Massimo Dobrovic was destined to play the king of vampires, but “happily married gay man” may be his favorite role yet. 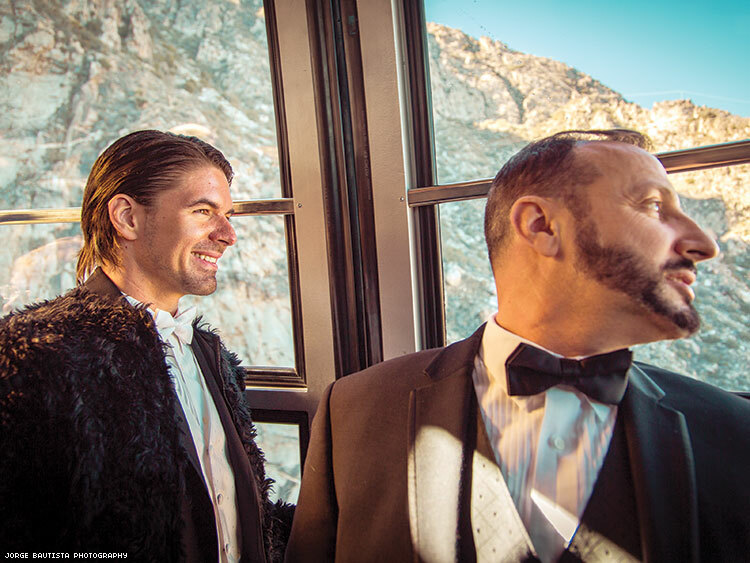 Above: For their wedding, actor Massimo Dobrovic (left) and Paolo De Angelis rode the Palm Springs Aerial Tramway from the desert floor 8,516 feet into the air to the snowy Mount San Jacinto State Park. 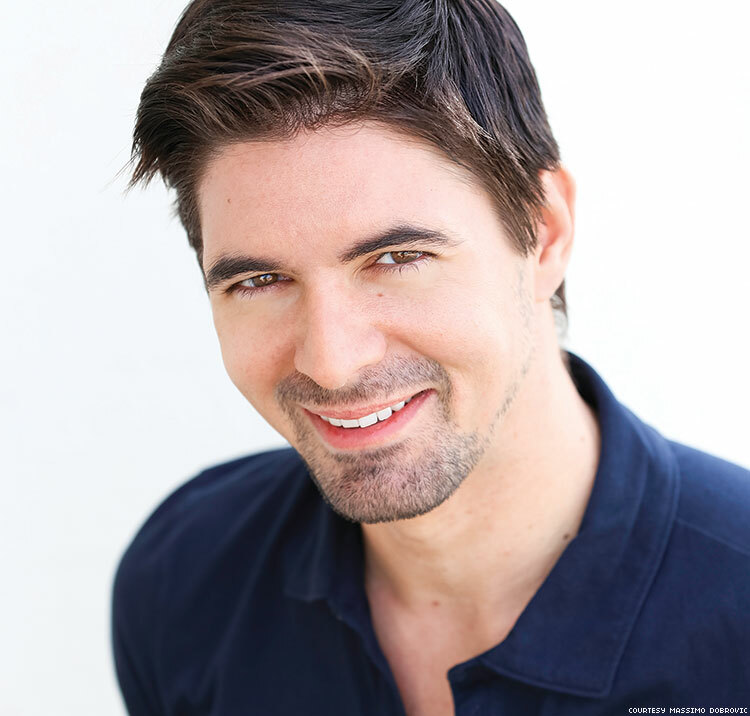 Actor Massimo Dobrovic has made a name for himself on the international film and TV circuit, often playing our favorite villains — a serial killer, vampire king, zombie chaser, and cartel bad guy. American audiences have seen him in action films like the recent Altitude with Dolph Lundgren and as a fan fave on the Bravo reality series Euros of Hollywood. Ruggedly handsome and darkly brooding, with high cheekbones and captivating amber eyes, Dobrovic is an actor in high demand. That’s because he’s fluent — and able to act — in five languages (English, Italian, Spanish, Croatian, and Serbian). After fleeing war-torn Croatia at 6, Dobrovic was raised in Rome, where, as a child actor, he joined the Italian National Theater at 12. Later, he represented his country at the United World Colleges, one of 12 such schools around the world where young adults are handpicked to study for free and become educated global citizens. 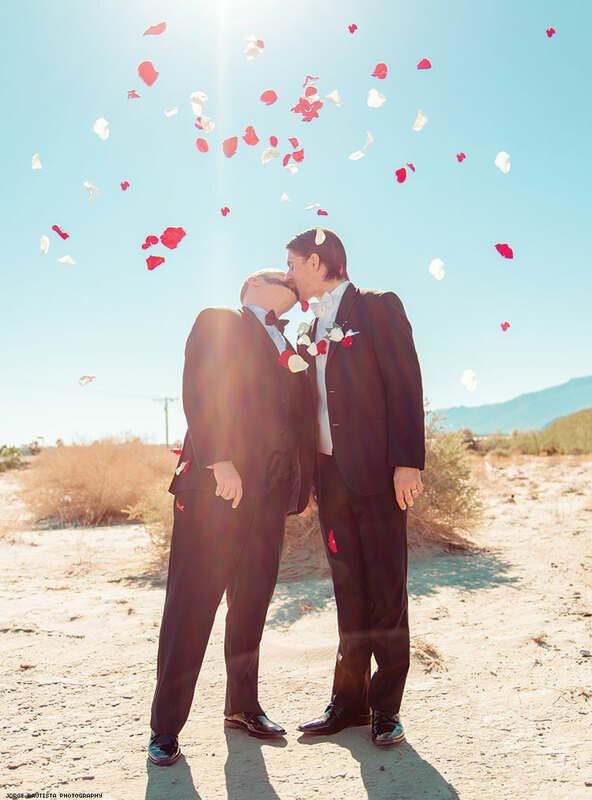 But after a lifetime of playing tough guys, Dobrovic faced one of his toughest acts last December when he came out as gay and married his partner of 10 years, business manager Paolo De Angelis, in a gorgeous Palm Springs, Calif., wedding. The nuptials and his coming out at 32 were both a long time coming. But Dobrovic says he’s “ready” and wants the world to know how important De Angelis is to him. With four movies on Netflix, two TV miniseries coming out (the vampire-themed Age of the Living Dead and zombie-themed sequel Feel the Dead), much-anticipated films (like Nation’s Fire and Behind the Curtain of the Night), a new cookbook (Italian for Any Occasion, cowritten with his husband), a secret TV show in the works (to be announced in January, 2018), and the first U.S. production of the gay British comedy Positive (which he directed for the Desert AIDS Project), Dobrovic is really just getting started. Above: Dobrovic and Angelis seal their nuptials with a kiss. You’re a lead in the vampire TV series, Age of the Living Dead. I play king of all the vampires that derives from the original bloodline of vampires. I’ve done all the horror movies here in America — because I was born on Halloween night. I’m drawn to those [roles]. Because of my voice and because of my look, I do a lot of horror. [The sequel Feel the Dead] is about these zombies coming out of the volcano. We were shooting on top of an active volcano. We had a mini-eruption one night! What draws you to playing villains? I love playing villains. You have to be completely fearless when you are portraying the villain … to access feelings or emotions you thought that maybe you didn’t have. A villain is never ordinary. There’s always something extraordinary about him, and there is always some craziness going on. Talk about coming out. Why now? In Hollywood, it’s not easy to come out, especially when you do a lot of action movies. In 15 movies … I only played one gay role. [Paolo’s] really the reason I do what I do in my life because he has been supporting me for 10 years. He has been beside me in the ups and downs. And you need a person you can always count on in this profession. My biggest fear is to live a life that is not me. I did not want to live a life that is a fake life or pretend to be somebody I’m not. It was hurting me inside. I wanted to be truthful to who I am as a person. [I hope] it will not affect my work and the way I’m being cast. I hope my work will speak for itself. [But] I want to be part of the LGBT community around the world, and I want to feel a part of this movement. I hope [others] will get inspired to come out and live their life truthfully. I have this movie with Marcia Cross coming out … Behind the Curtain of the Night. It’s a great movie [based on] a best-selling novel in Czech Republic. Brendan Fraser plays an American on vacation in Prague. It’s about a real-life story of the director, that he was proclaimed dead for eight minutes because he drowned. During this eight minutes, he relives his life in the past, present, and in the future. It’s a very, very sci-fi movie, and it’s going to be great. Above: The actor says he won’t let coming out ground his soaring career.